This week is going to be busy for our SIFAT staff, but you have several opportunities to get involved. Check out the schedule below to see what’s happening! Tuesday, 4-6 p.m.: Sarah Corson will be at His Place Christian Resources in Lineville, Ala., for a book signing as part of His Place’s Christmas Open House. For more information, click here. 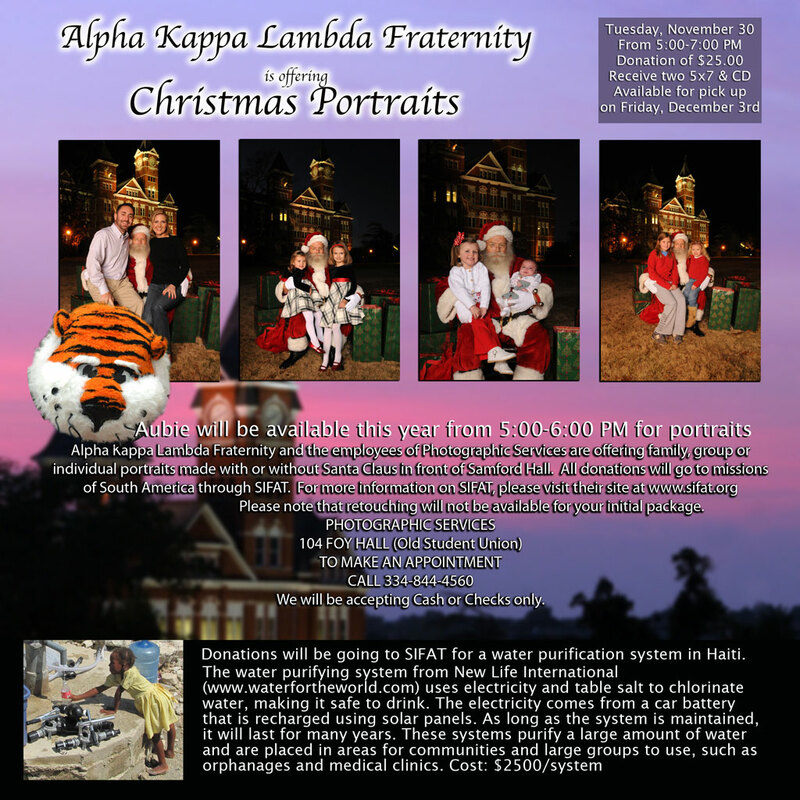 Wednesday, 6-8 p.m.: Alpha Kappa Lambda and the employees of AU Photo Services are offering Christmas photos in front of Samford Hall on Auburn’s campus. For a $25 donation, you’ll receive two 5×7 photos and a CD with digital copies that you can have reprinted or use for Christmas card photos. For more information, click here. Sunday, 2 p.m.: Sarah Corson will have a book signing at Wedowee FUMC in Wedowee, Ala. The event will start with Sarah reading an excerpt from Risking Everything. For more information, click here. *Don’t forget to use igive.com or goodshop.com when you’re shopping online for Cyber Monday deals and Christmas shopping! Both of these sites allow SIFAT to receive a percentage of your total purchase. It’s free money for us, and a way for you to donate without realizing it! See our past posts about iGive and Goodshop to learn more. You are invited to help the SIFAT staff celebrate our cofounders Ken and Sarah Corson’s 50th wedding anniversary at an informal cookout on August 16 at 10 a.m. Since leaving directly from their honeymoon to serve in Cuba, their marriage has been a legacy to missions, with almost 30 of their 50 years together given to SIFAT. We would like to put together a scrapbook for Ken and Sarah with meaningful photographs and stories. Please bring your photo and/or story to include in this very special tribute to their marriage. If you cannot attend, please send your contribution to include in the scrapbook. Remember to include your names and when the photo was taken. Ken and Sarah ask that anyone wanting to give a gift in their honor send it to SIFAT for the Sarah Trust Fund. We hope you’ll join us at the lodge on SIFAT’s campus at 10.a.m. sharp for a special program, lunch and a wonderful time of celebrating their lives together. Please RSVP by August 1 by calling the SIFAT office (256.396.2015) or by e-mailing Marie (lanierm@sifat.org).